Cam continues to battle joint and knee pain at bedtime. Each night he is able to fall asleep, but then wakes up every couple of hours in pain. 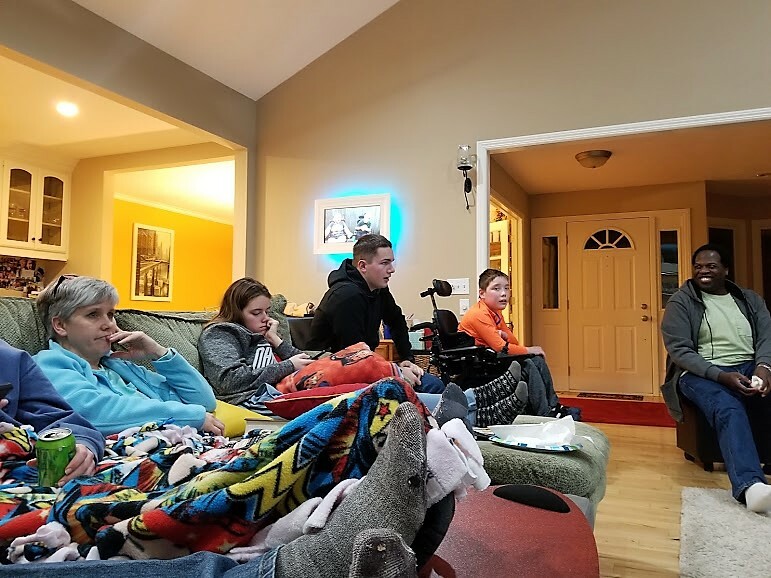 Chris and Jane have explored different options, moving Cam to the couch, to the hammock swing, even his power chair, attempting to find some relief, along with a slew of doctor's appointments. During the day, it seems Cam is amiable enough, still wanting to go to school, even with the disruptive rest. This week, Jane traveled to North Carolina for work meetings and was fortunate enough to spend some time with 'Auntie' Leslie. Back at home, the boys enjoyed playing xbox games in the evenings. Jane arrived home Wednesday night. 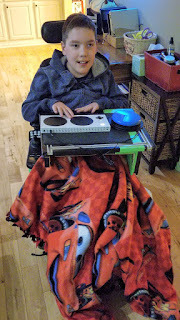 Thursday morning, Cam was scheduled for an ultrasound of his hip and knee to determine if they could find anything. After the non-painful procedure, we left the hospital and dropped Cam off at school. That afternoon, Jane received a phone call indicating that the ultrasound did show an effusion (packet of fluid) located on his left hip. The hospital told us they had an opening for 2:45p the next day, Friday. It would be considered outpatient surgery since Cam would need to be sedated. Always the trooper, we sat down with Cam after school to explain the next day's activities. The biggest challenge would be not drinking any water after 10:30am and not eating anything after midnight until around 4pm the next day. Even after a restless night, Cam didn't complain about the day ahead. We kept him home from school since it would be difficult to concentrate without any sustenance. As we were sitting in registration at the hospital, Jane received a text from 'Auntie' Karen with a gift card from Amazon video- perfect timing! Cam knew right away he wanted to purchase the new Grinch movie to watch over the weekend. 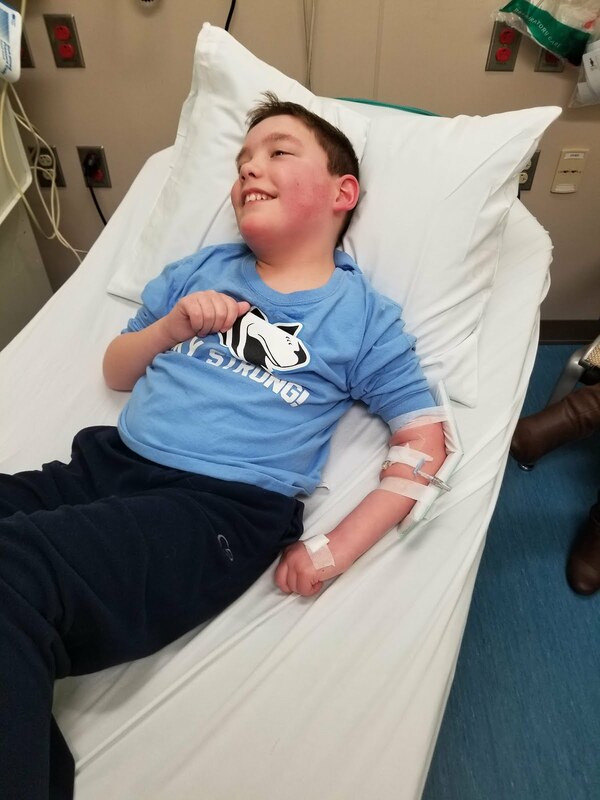 It proved challenging for the nurses to find a vein for Cam's IV due to lack of nourishment and a stressful situation. Our routine boy informed us prior to his short surgery that he would like to request "an adult-size meal and not a Cam-size meal since I am eating breakfast, lunch and an early dinner all at once!" Friday evening brought a bit more rest, but not much. The effusion was not the 'miracle' we were hoping for. However, Saturday was an eventful day. A huge edible arrangement arrived from 'Auntie' Jo and Will complete with balloons, fruit platter, and three cups of chocolate covered apples, bananas and strawberries. Cam was notably excited and the fruit was a welcome treat! In the late afternoon, Miss Kaylee arrived to hang out with Cam while Chris and Jane enjoyed an early evening out. It seems no matter what we are going through at the moment, especially when we fall, our friends we call family, are always there to pick us up! Fun Valentine's Facts: Wearing your heart on your sleeve is more than just a phrase. In the Middle Ages, young men and women drew names to see who their Valentine would be. According to Smithsonian, they would wear the name pinned to their sleeve for one week so that everyone would know their supposed true feelings. People consider pink and red the colors of love. According to the National Confectioners Association, around 65% of Americans believe that the packaging of Valentine's Day candies and chocolates should be red and pink. Candy hearts were originally medical lozenges. In 1847, Boston pharmacist Oliver Chase invented a machine that simplified the lozenge production process, resulting in the first candy-making machine, according to The Oxford Encyclopedia of Food and Drink in America. After identifying an opportunity to revolutionize the candy business, Chase shifted his focus to candy production with Necco wafers. It wasn't until 15 years after the creation of Necco wafers that Daniel Chase's brother, Oliver Chase, developed a way to press words onto the candy lozenges with a felt roller pad and vegetable food coloring. According to The Huffington Post, the conversation candies officially became heart-shaped in 1902. At school this week, Cam enjoyed friendship celebrations. 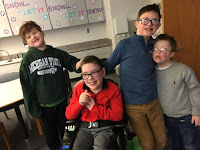 In the classroom, buddies Ben, Brody and Gerrit are always ready to hang out. These guys have been together since kindergarten. Cam is using the keyboard on a small computer to type his homework and writings at school. 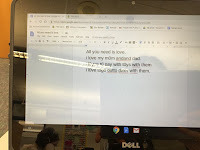 For his journal this week, his entry as shown: "All you need is love. I love my mom and dad. I love to play with toys with them. I love to go out to dinner with them." 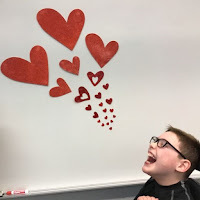 A Valentine tradition at Northern Trails 5/6 is school-wide bowling on or around Feb. 14th. We had called ahead to be certain Cam's powerchair could make it onto the lanes. Our 11-year-old announced upon arrival home that day, "It was so cool that my entire school was there. They had 2 times for different classes to be there. It was fun!" Friday marked a half day for Cam and Oma and Opa were so sweet to drive in to spend the afternoon with their grandson while Jane worked. Cam kept Oma busy playing Guess Who and other games during the day. He also showed off his typing skills since Cam's school sent home a Chromebook (small pc) just like he uses in the classroom. Oma had her hair done on Saturday. She looked so pretty when she got back. Cam showed off a V present from his parents: "Hangry" socks. It is definitely one of his moods if he isn't able to eat at regular times: hungry + angry= hangry! We didn't venture out on Sunday since the weather turned into a blustery snow globe outside. Cam has acquired some pretty funny sayings...while giving his parents hugs.."I am squeezing all of the love out of you!" or "I am refilling your love!" "My dad is the nicest dad! He is the nicest one I've seen in years." 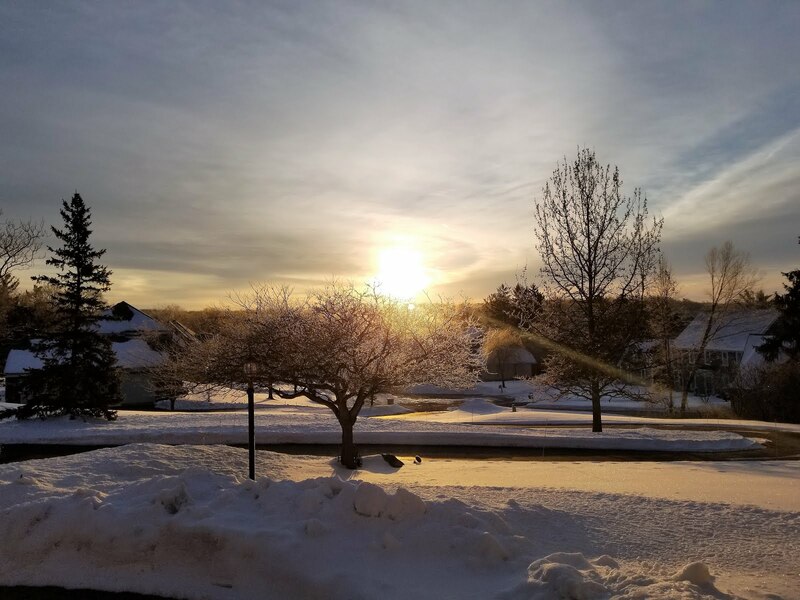 The crazy weather continued when the temperature warmed to 50 degrees Monday morning in Michigan as Jane boarded her flight to San Diego for work. Luckily she made it out before the next round of ice arrived on Wednesday. With the mild conditions, everything was in a meltdown mode. And then it rained. When the temps dropped dramatically, it acted like a flash freeze! 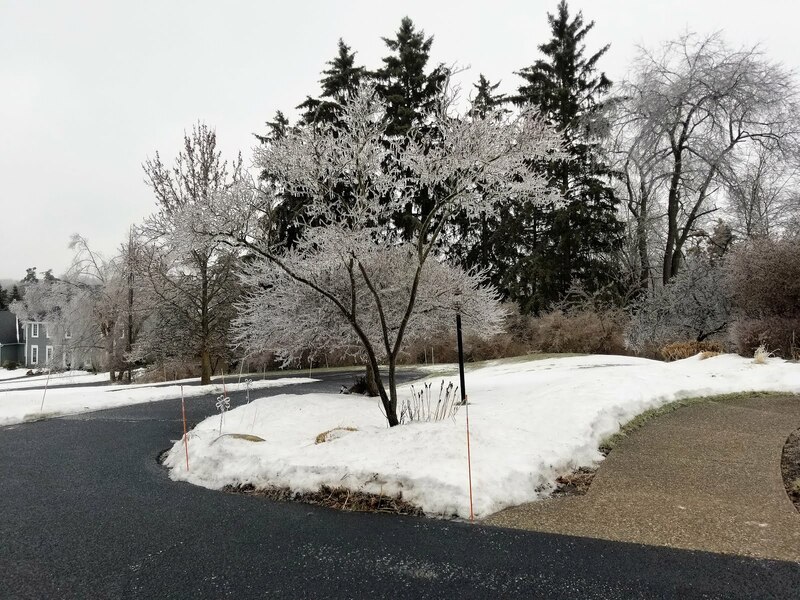 All areas covered in any precipitation suddenly glistened with an icy finish. No school again for Cam on Wednesday. He did test out the conditions on our driveway which appeared to be an icy mirror. Thursday morning, we headed downtown to see Cam's orthopedic specialist. His left leg was still giving him problems. His doc indicated he thought our growing boy was experiencing some spasms and tightness. X-rays looked good and we left there with a leg immobilizer for Cam. With the remainder of the week off of school due to the weather, the brace remained on his leg all day and all night. We didn't think Cam would be able to sleep with it on, but he said it felt much better with it. The picture looks similar to one Cam is using. Our annual Sunday meal with the Raisch fam was 'breakfast for dinner' and we dined on homemade waffles with available toppings of syrup, homemade strawberry jam and whipped cream, bacon, scrambled eggs and fresh fruit. As Cam likes to say, "It's good to change it up!" "Chances are not looking good, Miss Konkle!" 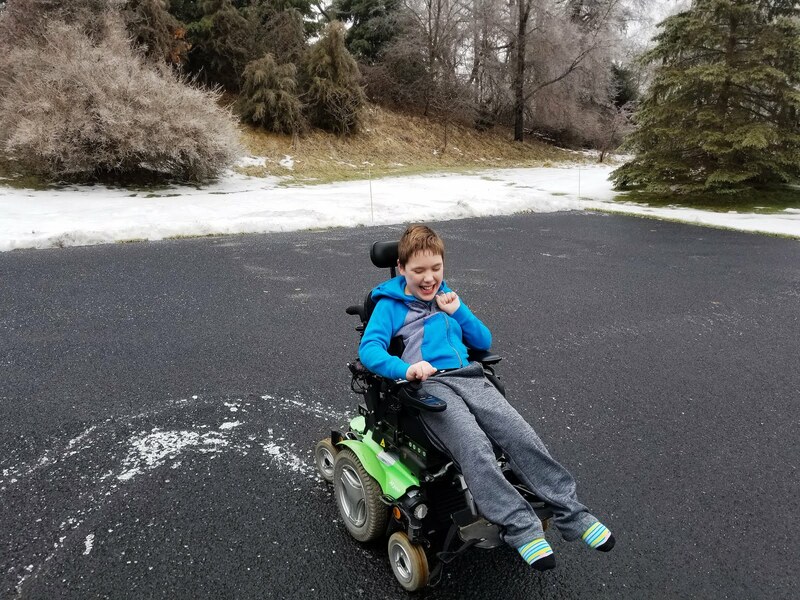 Cam's dad never experienced "snow days" in his younger years since he lived in Arizona and Washington state for most of his schooling until college. Cam's mom recalls some days off growing up due to heavy snow. However, this week seemed one for the history books since Cam had every...single..day at home while the city tried to recover due to inclement weather. And fortunately for Cam (and Jane! 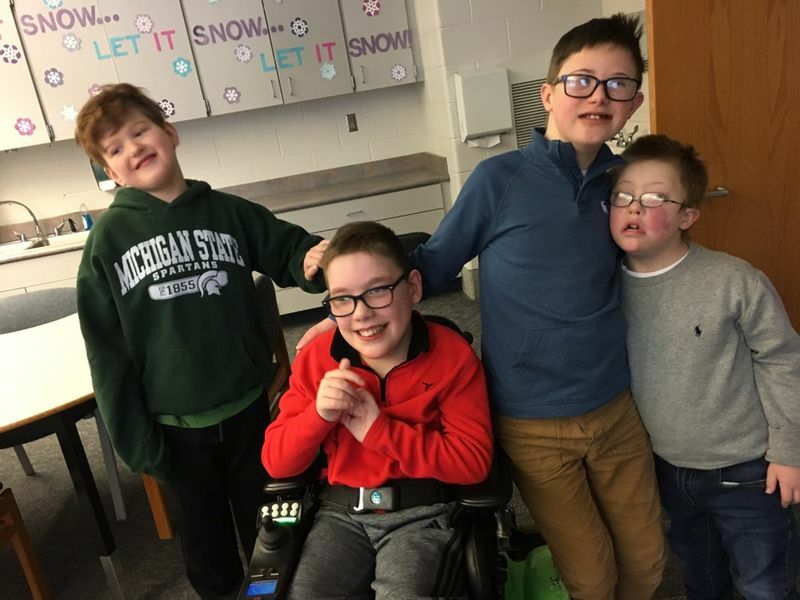 ), Miss Amanda also experienced school closures and was able to make it over to hang out with her buddy every day while Jane worked. Our cat, Stella, seemed to go into hibernation mode for the duration. 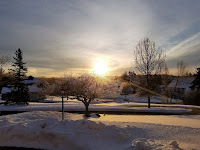 The blustery mornings were a combination of heavy snow and frigid temperatures. 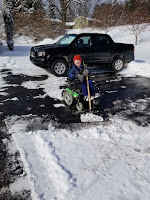 A couple afternoons held reprieve allowing Cam to assist with shoveling while Chris tackled the heaviest white stuff in the converted riding mower/snow plow for the winter months. With negative temps one morning, Chris and Cam tried a little science experiment. After getting one of Chris' t-shirts wet, ringing it out and putting it on a hanger, they hung it outside on the front porch. It only took a few minutes for the garment to flash freeze into an icy hardened shirt that nearly "stood up" by itself. By the time Friday rolled around, cabin fever had set in. Fortunately, we were honored to be invited to a dinner celebration for Miss Amanda and Nick's engagement. It was hosted by Nick's family at a local restaurant, Brann's. 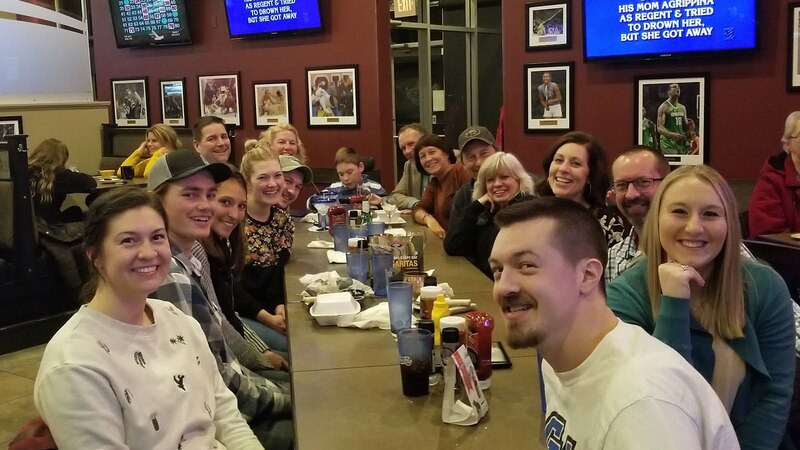 We had quite a crew assembled: Miss Amanda's family including Aunt Carol and Uncle Jim as well as Nick's family and our family. Cam was sporting his new hat "Boverhof Builders" a gift from Uncle Jim and Aunt Carol depicting their business name. They certainly did a nice job keeping our son occupied as we waited for food to arrive. The next morning, we had a big day planned. 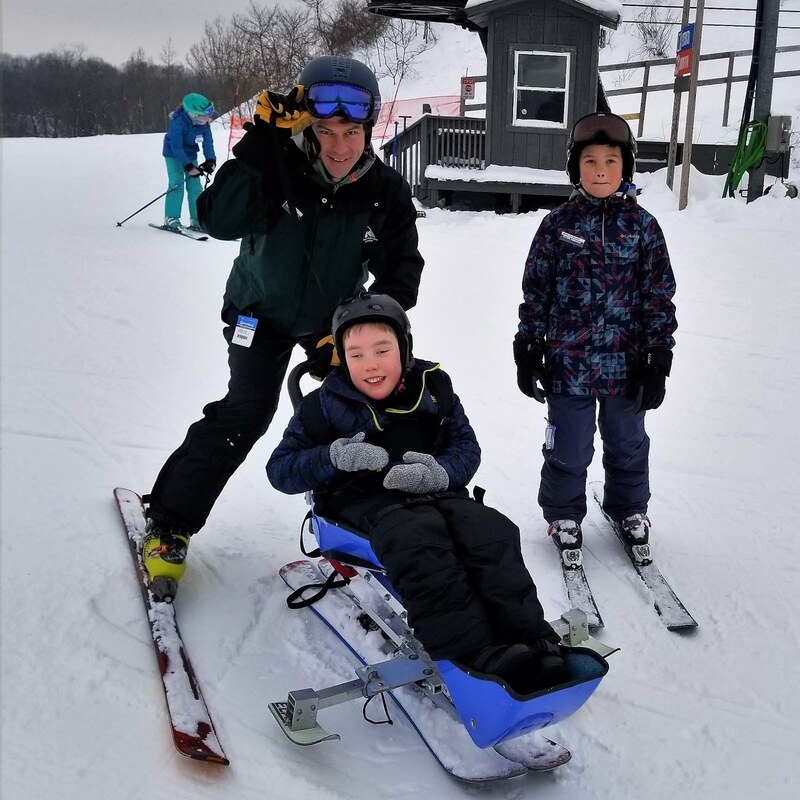 A few months ago, Mary Free Bed offered a sign up for Adaptive Skiing at our local ski area, Cannonsburg. The event description- An invigorating schuss down the slopes provides both a good physical workout and social networking opportunities. Downhill skiing is available to individuals with various types of disabilities. 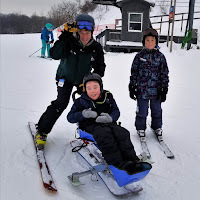 Professional volunteers are provided by the Cannonsburg Challenged Ski Association, a chapter of Disabled Sports/USA. An instructor is paired with the adaptive skier and they're able to hit the slopes for an entire two hours. We arrived at 9:30a ready for 10 o'clock start time. Cam was assigned to Rick, his instructor and Rick's son, Ben, who acted as the 'blocker' making certain others don't ski too close. As an added bonus, Chris brought his snowboard and was offered a discounted lift ticket to join in the fun. Since he was able to board alongside, he captured some great video of Cam in action! 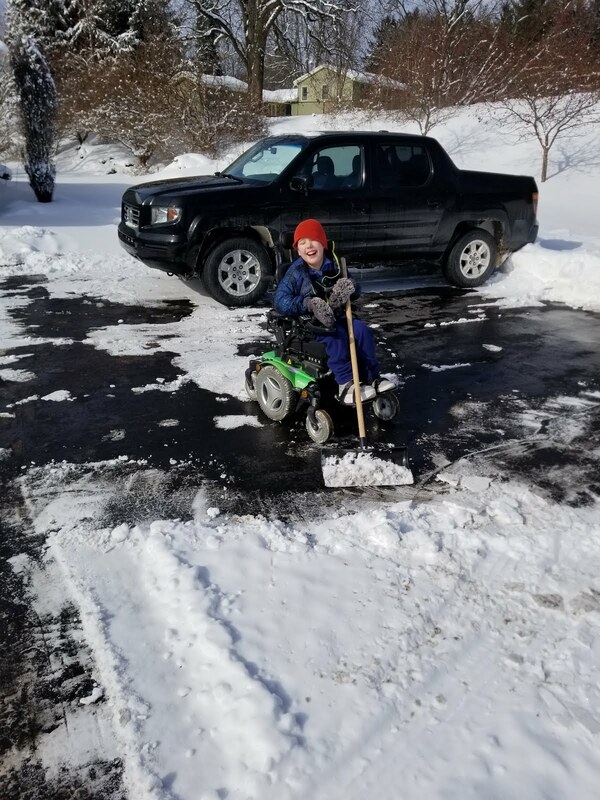 Although Cam wasn't sure at first, after his first run down, he declared "This is awesome!" Over and over again, up the chairlift and down the slopes they went. Afterwards, we were able to warm up in the lodge and have lunch before getting ready to go. In the meantime, one of our local news crews had arrived. Mary Free Bed asked if we would chat with them to talk about our experience. From Wood Radio: A partnership between Cannonsburg Ski Area and Mary Free Bed Rehabilitation Hospital allowed a group of kids with special abilities to hit the slopes on Saturday. 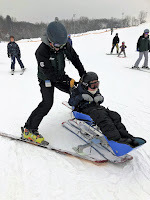 Specialized equipment like downhill ski sleds and arm riggers helped to ensure that children of all abilities shredded down the slopes. 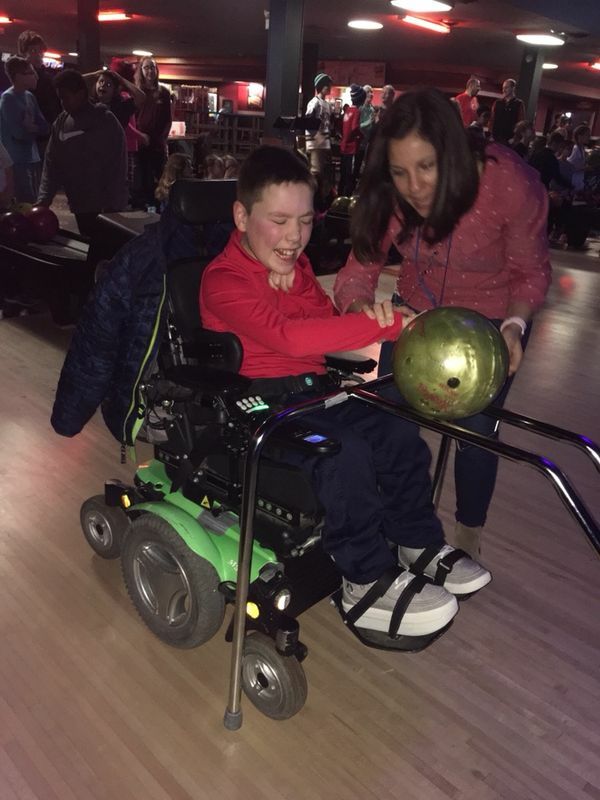 Jane Weatherford is no stranger to the challenges her son, Cam, faces. While he is typically bound to his power chair, on Saturday, he was free. “Having that freedom. Like anyone else, skiing,” Weatherford said. “Having that freedom of sitting and being able to go down the hill like everybody else on skis, it's incredible." No mogul too sick, no bump too gangly. “What’s important for us, too, is that community at large sees the inclusiveness and the inclusion of people who normally don't have the ability to do things like this,” Weatherford said. Things any kid would enjoy like something just as simple as freedom – and going fast. 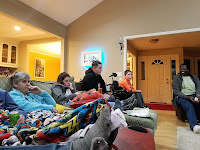 On Sunday, we hosted a small SuperBowl viewing with our neighbors and friends, while feasting on wings, homemade french fries and a various assortment of other 'not so healthy' items to munch on. The football game wasn't too exciting for Cam, and lucky for him, his buddy Emma decided to join in for quite a few rounds of the board game "Guess Who?" which has become his favorite. 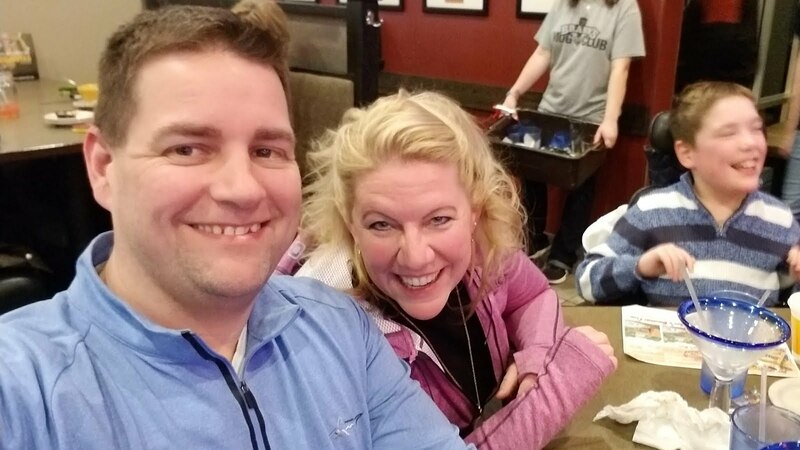 Before the end of the evening, Cam made certain Jane had sent out an email about adaptive skiing, ensuring we knew when signup would take place for the next season. Our son may be excited about hitting the slopes next year, but his parents are even more giddy about the possibility for our family to participate in a sport available to us all. 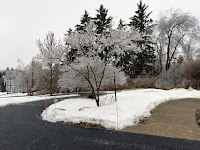 On Saturday, when we arrived at Cannonsburg, it was still below freezing, but by the time were ready to leave a little after 12p, the parking lot had turned into a slushy mess. As we waited in line to drive up the hill to exit, we realized we would be waiting quite some time as we watched one vehicle after another become stuck. "This is not my idea of fun." "Someone needs to call the police."